Where great careers take shape. From coursework to practicum, gain the experience you need to excel. We are proud to provide a quality education in a Christian environment and prepare you for your career, whether your eye is set on becoming a registered dietitian, working in sport management, or another profession in health and fitness. Studying in the health care capital of America allows for ample opportunity in hospitals, clinics, rehabilitation centers and health and fitness facilities. Engage in lab research projects or work with graduate students and professors. Take advantage of experiential learning opportunities that will put your career on the right track. The Lipscomb University Didactic Program in Dietetics (DPD) currently has accreditation by the Accreditation Council for Education in Nutrition and Dietetics (ACEND) , a specialized body of the Academy of Nutrition and Dietetics (A.N.D. ), recognized by the United States Department of Education. In order to be credentialed as a registered dietitian, the student must complete a post graduate 1200 hour internship program accredited by ACEND and sit for a registration examination. For details about this process, click here. An internship is usually 6-12 months or longer if combined with a graduate program. A list of these programs and their locations are available at the AND website www.eatright.org. After successful completion of the post graduate internship, the individual must pass a national examination administered by the Commission on Dietetic Registration (CDR). To maintain the Registered Dietitian (RD) status, continued professional education is required. Lipscomb has had a dietetics program since 1979. The current director has been at Lipscomb for 20 years. Our program uses a variety of methods to assess how well we are meeting our program goals. We conduct surveys of seniors, graduates, internship directors, and employers to evaluate the quality of our educational experience. Our data indicates a 96 percent placement rate of our graduates into internship programs. We have had a 100 percent employment record for graduates seeking jobs in the dietetics field as registered dietitians. Surveys indicate the majority of our graduates would recommend our program to others. The graduates expressed a high regard for the instructors in the program and the individual attention they received as a student at Lipscomb. We are dedicated to serving our students by integrating Christian faith and practice with academic excellence while preparing you for careers in exercise science, health and physical education-teaching, coaching and sport management. 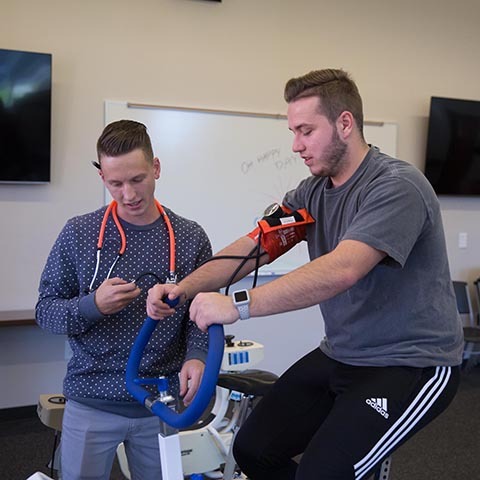 Our students typically enter careers in the health and fitness industry, or pursue graduate work in exercise physiology, cardiac rehabilitation, or other health science areas such as physical therapy, occupational therapy or therapeutic recreation. Students interested in the NCATE-approved Health and Physical Education Teaching option will work in conjunction with the Department of Education preparing for a teaching career. If you’re pursuing sport management you will learn the business side of the sport and athletic industry. We also provide all university students opportunities for developing healthy and active lifestyles through the general activities program. A wide variety of sports, fitness activities and lifetime fitness classes is available for all students through the general education curriculum. The Human Performance Laboratory is an advanced research facility housed in the Exercise and Nutrition Science graduate program at Lipscomb University. The Human Performance is designed for the assessment of a variety of aspects of human performance and physical fitness including cardiovascular endurance, pulmonary function, muscular strength and power, body composition, flexibility, and blood markers. Beyond our research goals, the lab provides undergraduate and graduate students the opportunity to use some of the most advanced equipment in their field of study, gain experience in conducting scientific research, and develop skills necessary to become exceptional researchers and practitioners. Electromyography (EMG) System (NORAXON): Allows the non-invasive measurement of the electrical activity of individual muscles or muscle groups. Metabolic Measurement System (True One 2400, Sandy, Utah): uses indirect calorimetry to allow the assessment of VO2max, when used in conjunction with a motorized treadmill or cycle ergometer. Monark Ergomedic 828 E Bike (7): Bikes designed for fitness testing and power output. Lode Excalibur Cycle Ergometer: This electronically braked ergometer is considered by many to be the "gold standard in ergometry” this highly adjustable device can handle high workloads that are characteristic of today’s athletes. Rogue S4 Monster Lite Power Rack: 11-gauge steel power rack with custom power platform. This customizable power rack allows for measurement of maximal muscular strength and power. Dual Force Plates (PASCO®): Used to measure ground reaction forces generated by the body either standing or moving across on them. These dual force plates are designed to quantify vertical jump power, isometric mid-thigh pull power, balance, gait, and other parameters of biomechanics. Biodex Isokinetic Dynamometer (BIODEX): Multi-joint isokinetic machine used to assess neuromuscular control, imbalances, range of motion and strength. Monark 894 E Anaerobic Peak Bike: Bicycle testing device used for the Wingate 30-second Anaerobic Power test. Baseline Hydraulic Hand-Grip Dynamometers (2): A device used for accurate measurement of force exerted by hand-grip. GE Healthcare Logiq e Portable Ultrasound Instrument: Safe, non-invasive, portable device with the capability to measure and analyze muscle size and architecture. BOD POD® Plethysmography: Utilizes air displacement technology for precise assessment of total body fat and lean body mass. Bioelectrical Impedance Analysis InBody770 (2): Resistance against an unnoticeable electrical current sent through the body in order to non-invasively determine fat and fat-free mass. Lange Skin Fold Calipers: Designed for the measurement of skin thickness measurements for estimation of body fat percentage. Health-o-Meter Professional Scale: Highly accurate, medical-grade weighing scale. HUMAC Balance System (CSMi): Computerized Balance Measurement and Training System used for assessing balance, stability and center of pressure. PostureZone Grid: Posture grid which allows for assessment of postural and balance changes. Functional Movement Screening (FMS) Measurement System: Assessment tool designed for use in conjunction with FMS screenings providing a simple grading system to assess athlete/patient movement. Our student dietetics association serves to assist members in becoming more professionally active in the field of dietetics, as well as increasing awareness of opportunities and events related to the profession that may be occurring either locally or nationally. The SDA also conducts a number of service projects each year in an effort to make others more aware of issues related to nutrition. Earn a degree that will pave your path to a career as a physical or occupational therapist, physician assistant, chiropractor, nurse, or any other professional health care field you could imagine. When you graduate, you’ll join the rest of your peers who landed careers in the field or were admitted to the allied health graduate schools of their choice. Kick your future into high gear with a degree in fitness and sports studies. This unique program combines the fundamentals of kinesiology with courses in business and psychology to equip you with the all skills you’ll need to thrive in the field of fitness, wellness, and strength and conditioning. Our expert faculty will train you to develop both physical activity and health curricula programs. You will dive into the classroom and the gym at a local K-12 school for hands-on experience with students of all ages. With its three major league teams and four Division I NCAA schools, Nashville is the perfect city for you to score shadowing experience, internships and jobs. Study in a program that provides you with a comprehensive business education and the added exercise science knowledge to elevate your expertise. Study under passionate faculty who are dedicated to your growth and success. Our program is known for its ability to prepare graduates for graduate study and careers in nutrition and dietetics — once you earn your degree, you could go on to join 100 percent of your peers who were accepted into dietetic internship programs and went on to become RDs. From this program, you can go on to culinary school, restaurant management and nonprofit management — with a firm foundation in business, since you’ll automatically earn a business minor. Between coursework, faculty mentorship and internship opportunities, you’ll be well-prepared for whatever it is you are called to do. Your passion is to help others bring about a healthier lifestyle through their diet and nutrition. We can provide experiences to prepare you to become a registered dietitian through supervised practice and graduate level coursework.